Dark chocolate ganache with, pear, fennel &anise seed confit and genuine Absinthe liqueur. 72% dark chocolate ganache hand-rolled in crushed cocoa nibs and cocoa powder. Dark chocolate ganache features Goslings dark rum, fresh ginger, and lime zest - echoing the flavors of the Caribbean. Reminiscent of a deep, complex mole—a dark chocolate with red chile confit, sweet red pepper, red chile jam, fresh chile infused tequila and Mexican cinnamon. Crunchy toffee center, embedded with fruity and fiery green chile flakes from Hatch, New Mexico. Roni-Sue’s favorite chile! Each square is dipped in dark chocolate and topped with ground cocoa nibs & smoked vanilla sea salt. Absinthe— Dark chocolate ganache with pear, fennel & anise seed confit and genuine Absinthe liqueur. Dark & Stormy— Part of our Cocktail Collection, this dark chocolate ganache features dark rum, fresh ginger and lime zest—echoing the flavors of the Caribbean. Down the Hatch-- Crunchy toffee center, embedded with fruity and fiery green chile flakes from Hatch, New Mexico. Roni-Sue’s favorite chile! Each square is dipped in dark chocolate and topped with ground cocoa nibs & smoked vanilla sea salt. Manhattan— Part of our Cocktail Collection, this dark chocolate ganache features top-shelf bourbon, sweet vermouth, bitters & a cherry. Tai Chi Chai Tea—caramelized white chocolate center infused with custom-blended chai tea in a molded milk chocolate shell, drizzled with chai chocolate topping. 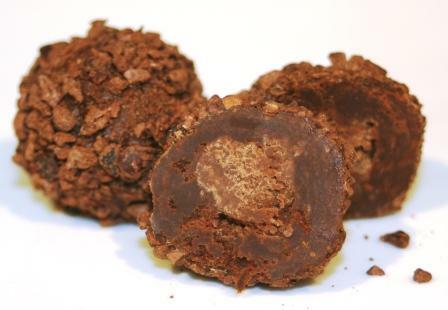 “Inna’ Pickle” Truffle—created for NYC International Pickle Day! Yes, it’s true! Key Lime Pie—molded dark chocolate shell, filled with white chocolate ganache flavored with key lime and topped with crushed graham crackers. Hibiscus—Molded dark chocolate shell, filled with white chocolate ganache made with hibiscus flowers, hibiscus jam and homemade hibiscus liqueur.